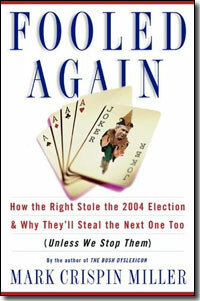 In the following interview with BeggarsCanBeChoosers.com, author Mark Crispin Miller talks about his new book, Fooled Again, which takes a look at the 2004 election. In this interview, Miller describes how America's current election system is "rotten to the core." He explains why American democracy is finished if the nation doesn't implement serious electoral reform immediately. In a nutshell, what is your new book, Fooled Again, about? Miller: The theft of the 2004 election. The book provides an overview of all the many tactics and devices that were used nationwide--indeed, worldwide--to cut the Kerry vote and pad the Bush vote. It's also an analysis of the fanatical mentality behind that vast crusade against American democracy. Miller: A sense of civic outrage, not only at the fraud itself but at the general silence over it. With just a few exceptions here and there, the whole political establishment, the press included, steadfastly refuses even to acknowledge the grave danger of election fraud. If we don't have serious electoral reform ASAP, American democracy is finished; and yet both parties and the press are largely unified in deeming last year's race legitimate. So there's been next to no debate over a major danger to American democracy, and, therefore, to our very lives and liberty. That silence is a grave betrayal of American ideals, and an insult to common sense, and I wrote Fooled Again to break it. At what point did you first become aware of problems in the 2004 election? Miller: Big problems were already popping up before Election Day--not just in Ohio, but in Pennsylvania, Florida, Minnesota, Texas and a lot of other places. There was evidence of a concerted effort to disenfranchise Democrats by using fake opinion pollsters in Nevada, Oregon, New Jersey, West Virginia and elsewhere. There were intimidation tactics, blunt obstructionism, state disinformation drives, and even break-ins, all over the country. There was interference with the huge vote of Americans abroad. All such evidence was on the public record--not in any prominent place, but out there on the record--prior to Nov. 2. After Bush & Co. miraculously won, all memory of those problems seemed to disappear completely from the national radar screen. Did you encounter many obstacles in writing this book? For example, did you find that officials were reluctant to talk, or that records were difficult to obtain? Miller: A lot of evidence was missing when I wrote the book and is still missing now. For instance, we still don't have the raw precinct-level data that was used by the official exit pollsters. The media corporations that paid for it won't make it available to independent scholars. And certainly the politicians and the bureaucrats, the party operatives and corporate personnel, observed a stubborn silence on a broad range of electoral concerns. Across the board, Republicans refused to answer questions; and a lot of Democrats were strangely eager not to talk about the numerous anomalies, contradictions, improprieties. Such stonewalling was a given, something that you had to work around. The evidence in Fooled Again comes either from the public record, or from people not afraid or disinclined to tell the truth. The mainstream media in this country have been reluctant to examine problems with the 2004 election. Why do you think this is? Miller: The U.S. media does not provide the crucial civic service that the Framers had in mind when they extended constitutional protection to the press. The U.S. press today, in other words, does not inform the people for the purpose of republican self-government. It answers not to us, but to its parent companies, their shareholders and advertisers, and, not least, the government, which keeps the cartel well-protected from the people. This is why the U.S. press will not report whatever news might pose a threat to the political establishment. It's why they never did report the truth about Bush/Cheney's drive for war against Iraq, even though there always was abundant evidence against the claims that Bush & Co. were making. It's why they've quickly veered away from every story that, if followed through, could well have blown the Bush regime to smithereens: 9/11, Gannongate, Katrina. And, worst of all, it's why the press refuses to report the ever-worsening condition of American democracy: last year's election fraud; the current push by Diebold to get its DRE machines into more precincts coast to coast, despite a growing wave of popular resistance; the mammoth money-laundering operation that was used to pay for the subversion of the race last year; the Bush regime's attempts to gut the Voting Rights Act; and so on. Do you believe that our nation's election system problems will be fixed in time for the 2006 elections? Miller: There simply isn't enough time. We do have time to get a good start on improving things considerably by 2008. Before the next election, there is time to organize a national grass-roots polling operation in the most important places. Such an effort--which ought to be bipartisan, or non-partisan--would at least provide us with a rough idea as to how accurate the final vote-count really is. In the meantime, we must do everything we can to force the scandal of last year's election out into the light of day. Once people know what really happened, they will demand electoral reform, and then we can debate how best to do it. If, on the other hand, the people keep on thinking, or half-thinking, that that election was legitimate, reform will seem unnecessary. "If it ain't broke, don't fix it." We have to tell the nation--and the world--that things are badly broken here. If we do not, American democracy will soon be past repair. I'd imagine that, after reading your book, there will be many alarmed citizens out there who will be wondering what they can do to help ensure honest elections in the future in America. What would be your advice to them? Miller: The effort must be local as well as national. Those concerned should learn about the voting system where they live and vote (or try to vote), and work to make it as efficient and transparent as possible. There are currently aggressive efforts under way to get Diebold machines approved, or their use extended, in New York, Pennsylvania (Bucks County), North Carolina, Arizona and New Mexico. In all those places there are grass-roots movements dedicated to genuinely democratic systems and procedures. The national effort must begin with--again--a vast campaign to tell the people what went down last year. Be relentless. Tell your elected(?) representatives, and the media, to investigate the fraud last year, deal openly and thoroughly with the danger of election fraud right now, and to pursue the issue of electoral reform ASAP. It simply will not happen if you don't demand it. Overall, are you optimistic or pessimistic, long-term, about the fairness of elections in America? Miller: The current system's rotten to the core. As far as the people are concerned, however, I'm an optimist. I'm confident that, when they learn the truth, they'll make the right decisions. That's why I wrote Fooled Again. I never could understand why Kerry was content to quickly concede in the 2004 election and why he and the Dems in general have been so reluctant to question the election results. The only thing I can figure is that they fear that rocking the boat will hurt their prospects in 2006 and 08. It's quite dismaying because, let's face it, if the situation had been reversed, the GOP would have raised holy hell about this issue and they would have made it a front-and-center issue that would have dominated the airwaves, day after day. And I could never understand how Kerry came from last place to first place, while Dean went from first place to last. Then Bush winning in November after all the exit polls initially said he lost. Now I know. The Presidential election is nothing but an illusion. The fix was in right from the start in 2004 and in 2000. Kerry is too feckless to have stolen the nomination from Dean. Having been in opposition to Dean in 2004, I think I can explain what happened to Dean: there were many of us, but we were quiet compared to Dean supporters. We were not strong supporters of anybody. We sat back and waited for the caucuses and primaries, where we went to cast our votes against Dean (or for another). But it was good that Dean ran and gained prominence. The Bushists, on the other hand, steal elections. The nominee IMO, in retrospect, should have been John Edwards. He was the least feckless Democratic candidate. Kerry had to overrule with fecklessness the not-giving-upness of Edwards, after the election was stolen. BTW I don't think Bushists stole the election for Kerry over Dean, either. The best way to attack the current Diebold touch screen voting system is from an accounting perspective. They can not be audited to verify their accuracy. Because security and accuracy are the chief concerns of designing a voting system, it is inconconceivable that this is something that was overlooked. You wouldn't design an ATM machine that way.